Street food is the best way to eat when you are in a country as diverse as India. From chatpati Chaat to mouth watering desserts like Falooda and ice candy, there is something fun about standing on the road side and munching on these good eats! Chaat of any kind is always welcome and I haven’t come across any Indian yet (is there one?) who doesn’t like chaat. I was blog hopping in search of a dish for this month's MBP, in the nth moment (like always!) and finally decided to look in my bookmarked recipes. And there it was….Lahori Channa Chaat or Chickpea Chaat. Just the name made me drool. We had an informal house warming party and chickpea chaat was on one of the sides on the menu. The original recipe is from here. I made a few changes to suit our taste, the recipe is as follows. Mix all of the above ingredients except the salt and refrigerate for a couple of hours or more. Add the salt right before serving, this ensures that the salad doesn’t become a watery mess and stays together. This chaat was out of this world and I’m glad I got a chance to make it. 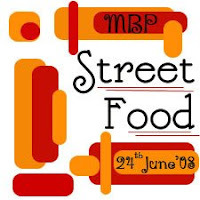 This is my entry to MBP – Street Food guest hosted by dear Sia of Monsoon Spice and originally started by Coffee of The Spice Café. I make it very similarly - and toss in some chopped cucumbers in the mix as well. Makes for a refreshing picnic dish. Looks yummy Namratha. healthy and delicious nammu..looks great! I am absolutely thrilled that you made this recipe and that it turned out so well. Thank you very much. I appreciate that you liked through to the recipe on A Life (Time) of Cooking. It really is one amazing dish, isn't it. Going to Gatlinburg in about 20 days, can't wait! very nice...simple combinations make the best dishes :)..loved this one..good entry. How's the new place and new kitchen?